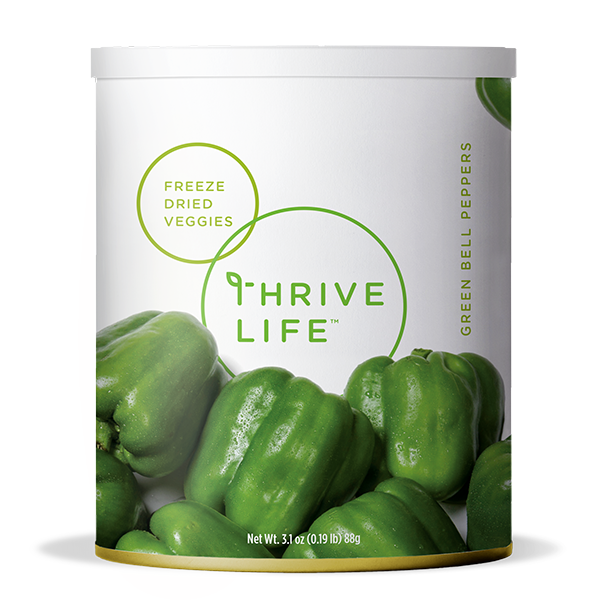 THRIVE Green Bell Peppers are just the thing to spice up any of your favorite foods. Try using green bell peppers in salsas, stir-fry, and soups. The bold taste will give a kick to your typical meal. Add 1/3 cup of water to 1 cup peppers; let sit covered for 3-5 minutes or until tender. The Red and Green Bell Peppers are larger chunks than the Mixed Bell Peppers and are great for omelets, rice dishes, burritos, and more. The Green Chili Peppers are smaller pieces that add the perfect kick of spice to all your Mexican favorites.